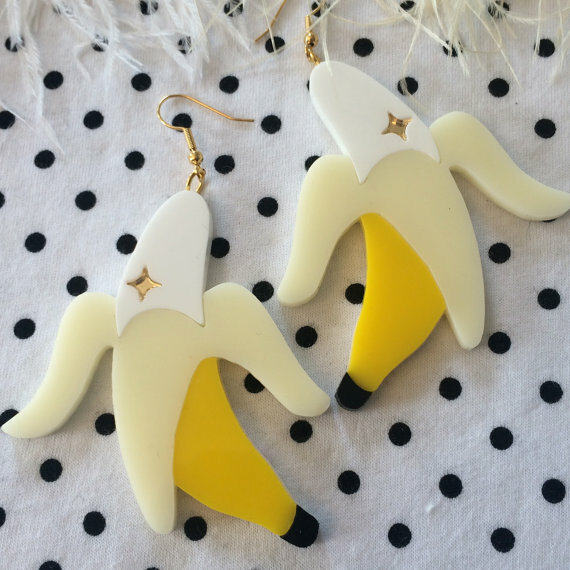 Above are banana earrings. They are laser cut from acrylic and come form I’m Your Present. This is a cute lazercut bow tie and flower pin from My Design Laser. This is a hand painted cyclops charm with gold chain. It’s laser cut and painted maple wood and is available from Ultra Terrestrial. 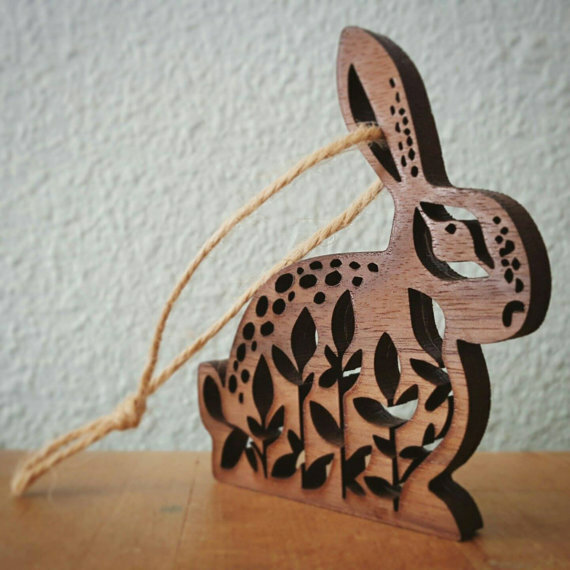 This is a laser cut rabbit ornament from Crystal Phegley. It’s made from cherry wood. Cute! Here is an ever so cute brooch set. It features laser cut, laser etched and hand painted wood and comes from The Twenty Fingers, who are based in Siberia! 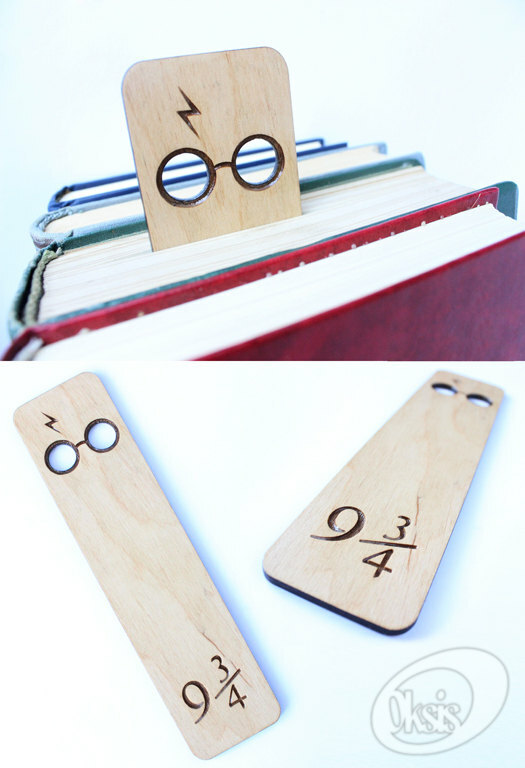 Above is a Harry Potter inspired bookmark. It is laser etched in plywood and comes Oksis. These are food allergies markers – laser cut and laser engraved from birch by The Rooting Box. So it’s clever. The series of strips gives flexibility to the necklace (like a variant on the Snij hinge), and connects with magnets, apparently. I’d be a bit worried about how delicate it is, as thin acrylic can snap, especially where you ask it to take stress like at 90 or even 180 degree bends. The clever thing here is any stress will be distributed over several points, so no one point will ever get overloaded. That said, it’s maybe best to treat it with care. Generally speaking, acrylic jewellery is as low maintenance as it gets. A quick wipe with a soft dry cloth will get rid of smears and smudges. A tiny drop of washing up liquid on a damp cloth will help if anything stubborn has got on there. Long term wear of your favourite piece of jewellery may end up with it being damaged through scuffing or scraping. Worst case scenario, it ends up broken. Most likely it’s joints that snap. Anywhere where there’s a weak point is a potential candidate for breaking. If you did have to fix your broken acrylic jewellery, you’d be advised to use an acrylic cement such as Tensol 12 or Tensol 70. Tensol 12 is quite viscous and fills gaps well without running (alternatives would be WeldOn 16 and Acryfix 192). Tensol 70 on the other hand is a water-thin catalyst cement which is better for larger areas which need a stronger bond than Tensol 12. It comes unmixed in two parts, which you mix together and apply through a fine syringe (if you ever wanted to play Doctor, now’s your chance). So the surfaces to be joined must be smooth and clean so the cement flows evenly between them. Capillary action is a term I don’t use very often, but it’s what’s going on here – the water-thin cement is drawn into the cracks and literally melts the acrylic it touches, creating a new layer of acrylic where there was a gap. Tensol 70 is completely clear in colour and evaporates faster than you can say “that was quick”, so it’s pointless trying to wipe away any spills. Just get it right the first time. Oh, and use a syringe with a non-rubber plunger as the solvent makes the rubber swell. So, magnets are cool. Laser cut acrylic necklaces are cool. Mending acrylic jewellery is easy with some handy Tensol, but wear gloves and don’t breathe the fumes, kids. Ideal for your chemistry teacher as a leaving present from school. Or maybe to give to a keen chemist? Or just someone who’s a bit geeky! These are called quite simply “chemistry beaker earrings” which is, you know, pretty descriptive. 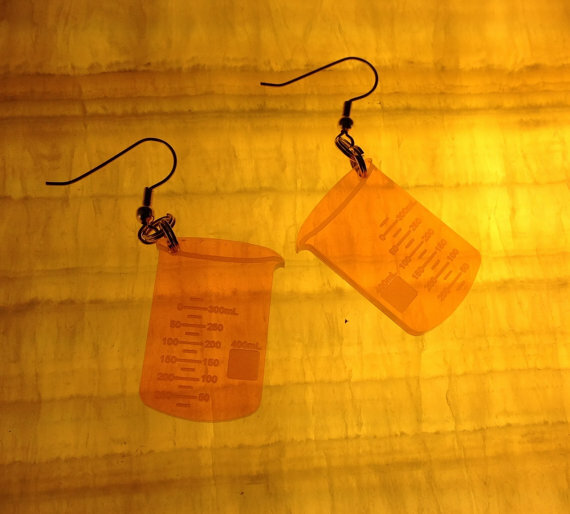 From Etsy seller Laser Addiction, they’re laser cut and engraved from fluorescent orange acrylic.